The head priest of Hazrat Nizamuddin Dargah, who along with another cleric had gone missing in Pakistan for days, returned home on Monday with their disappearance still shrouded in mystery amid reports they had been picked up by the ISI. Syed Asif Nizami, 80, the chief priest of the sufi shrine and his nephew Nazim Ali Nizami flew back by a Pakistan International Airlines flight and met External Affairs Minister Sushma Swaraj, who had taken up their case with Pakistan Prime Minister's Adviser on Foreign Affairs Sartaj Aziz. Though the two clerics did not divulge much about what happened during this period, Asif Nizami, however said, he was blindfolded and taken to some undisclosed place. "I was sitting at the Lahore Airport, carrying my boarding pass when suddenly some people came and told me there were some details lacking in my passport. "When the flight was about to depart, I was asked to accompany them. I felt helpless. Soon 8-10 people surrounded me and I was taken out through another gate," he said. Asif Nizami said they "put a cloth over my head and took us somewhere." He, however, said the stay was "comfortable" and the room he was kept in had bed, pillows and an AC. Union Ministers of State M J Akbar and V K Singh, besides Foreign Secretary S Jaishankar were present when the clerics met Swaraj. Both the clerics briefly met reporters in New Delhi but did not throw much light on their disappearance last Wednesday. While Asif Nizami had gone missing from Karachi airport, his nephew Nazim disappeared from Lahore airport before news broke on Saturday that they had been traced. However, Sajid Nizami, son of Asif Nizami, alleged that the duo was "taken away" after a news report appeared in a Karachi-based Urdu daily which claimed they had links with Indian external intelligence agency RAW. On reports that both of them could not be contacted as they were in interior Sindh where there was no communication network, Nazim Ali Nizami strongly rejected the claim. "We did not have visa for Sindh interior region, so how could we have gone there? The reports that we could not be contacted because of network issues is totally false," Nazim told reporters. On whether they were detained by Pakistani authorities, Sajid said, "Yes". When asked if ISI was involved in their disappearance and whether they were harassed, Sajid said "no force or coercion was used" against them. After meeting Swaraj, Nazim Ali Nizami thanked the Indian government, particularly the minister, for their safe return and said they had gone to the neighbouring country with a message of peace and love. "We were not among those who were involved in any illegal activities. We had gone to Pakistan to spread the message of love and peace. Some people may not have liked our message. I will again go to Pakistan with greater resolve," he said. 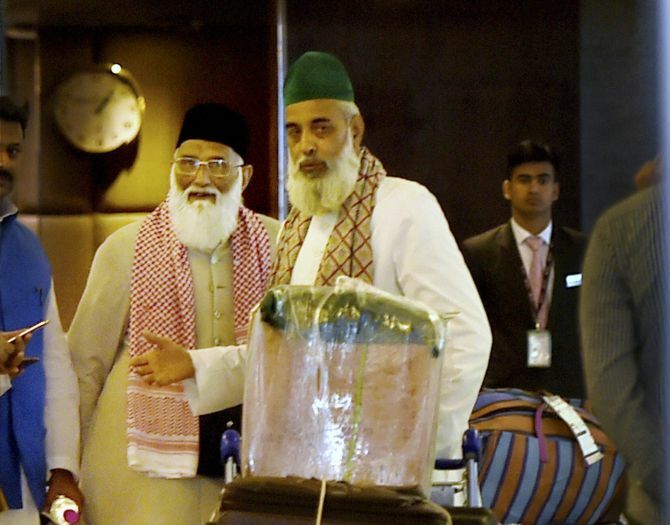 Nizami also thanked the Pakistan government for the cooperation extended by it to enable their return. Pakistani newspaper Ummat had in a report claimed that the clerics worked for RAW and Muttahida Qaumi Movement movement, an organisation of Muslims who had migrated to Pakistan from India during partition. The MQM has been often locked in confrontation with the Pakistani establishment. The two clerics were given a warm welcome on their return to the dargah and special prayers were offered to "thank the Almighty" for their safe return. Two two clerics had gone to Lahore on March 8 but went missing last week following which India took up the issue with Islamabad. The main purpose of the visit of Asif to Pakistan was to see his 90-year-old sister in Karachi. On Saturday, Pakistan had conveyed to India that the clerics had been traced and had reached Karachi. Some Pakistani media reports had said the two had been in "interior Sindh where there was no communication network" and that was why they could not inform their relatives about their whereabouts. Earlier, Pakistani sources had said they were in the custody of Pakistan's intelligence agency over their alleged links with MQM. When asked as to why they were "interrogated", Nazim said they were asked about their visa and other immigration details. "We thank Union Home Minister Rajnath Singh and Swaraj and well wishers from all religions who prayed for our return," Nazim said. Do Muslims have a future under a BJP government?